Lecco is a city located at the southernmost end of Lake Como’s southeastern branch. Because of this, this branch is often refered to as the Lecco branch. With its approximately 50,000 inhabitants, Lecco is smaller than the city of Como, but still offers city conveniences and is a popular base for Lake Como visitors. The distance to Milan is roughly 50 km. Nestled among the Bergamo Alsp to the north and east, Lecco was selected Alpine Town of the Year in 2013. Historically, Lecco has been an important spot for travellers seeking to cross the river Adda. The Azzone Visconti Bridge was built here as early as the 1330s. The Kennedy Bridge was finnished in 1956 and the Alessandro Manzoni Bridge in 1985. Minor Basilica of San Nicoló A church has been present on this site since at least the 11th century. Throughout the years, it has undergone cycles of damage and reconstruction. The church was made a basilica in 1942. There are several frescoes in the interior of the basilica, including “Life of Jesus” (1881) by Casimiro Radice. One of the chapels contains frescoes from the 14th century and a baptismal front from the 16th century. Santa Marta, Lecco The first church on this site was built in the 13th century or earlier. It was dedicated to St Calimero. Over the centuries, the church has been refurbished many times. The current facade dates to the 1720s. The interior roof is adorned with the fresco “Glory of St Martha”, created by Giovannni Battista and Carlo Pozzo in the late 17th century. The main alter features a 17th century processional statue of the Madonna of the Rosary and Child. There are also 16th century marble sculpture busts of the apostles. (Chiesa del Beato Serafino) This church is located in the frazione of Chiuso in Lecco. It has been damaged numerous times in fights between the Duchy of Milan and the Republic of Venice. The current church building replaced an older 13th century one. The present facade, bell tower and interior was last updated in the 19th century. There is an 15th century fresco cycle in the apse, attributed to Giovan Pietro da Cemmo. Santi Materno e Lucia This is a parish church and former Convente the Cappuccini situated on Piazza San Cristoforo in Lecco (in the Pescarenico neighbourhood). The church was originally dedicated to St Fracis. The church was refurbished in 1824-1834 and has been dedicated to Santi Materno e Lucia since then. Il santuario della Madonna della Rovinata This sancutary (shrine) was built in 1849-1859 and consecrated in 1859. Santuario di Nostra Signora della Vittoria The shrine of Our Lady of Victory was built in 1918-1932 and consecrated in 1932. It was created in memory of the fallen during the Great War (WWI). The tower bells will ring at seven o’clock in the evening every day to commemorate the victims of the war. The shrine is located in Via Azzone Visconti, near the city centre. San Francesco d’Assisi The parish church of San Francesco d’Assisi and its adjacent Capuchin convent are located in the outskirts of Lecco. After being expelled from Lecco by the Napolenic government in 1810, the Capuchins returned in 1949, welcomed by Cardinal Schuster. The new Capuchin convent was designed by Mino Fiocchi. Building it took two years and it was consecrated in 1951. The adjacent church has a two-story nave with an octagonal dome. There are eight chapels. 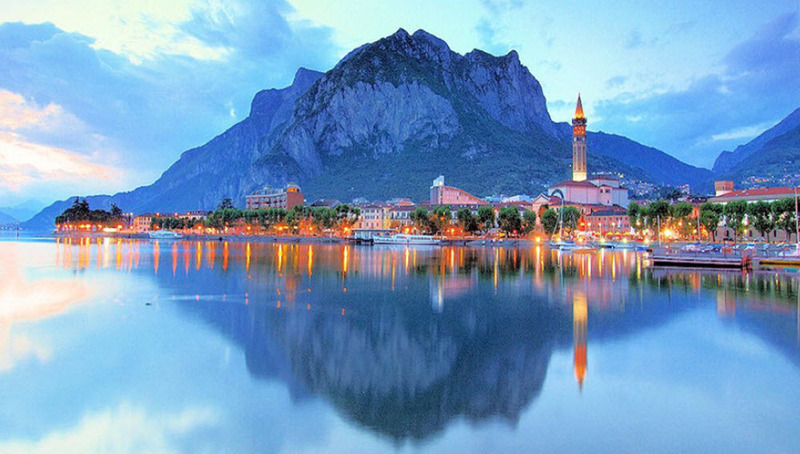 Lecco is the finish point for the cycling classic Giro di Lombardia. Lecco’s patron saint San Nicoló is celebrated on the 6th of December. Before the Romans invaded Lecco, Celtic people lived in this area, as evidenced by archeological findings of Celtic settlement remains. Due to the importance of Lake Como for transportation, the Romans built castrum here and turned it into an important transportation hub. After the fall of the Western Roman Empire, the town was captured by the Lombards in the 6th century AD, and then later by the Franks. In the 10th century, Lecco’s Count Attone led a revolt against the Holy Roman Empire, but this revolt was crushed by the Holy Roman Emperor Otto the Great from Germany in 964 AD. Later, Lecco became a possession of the Milanese monastery of St. Ambrose, and was eventually subjected by Milan. Lecco was then included in the Duchy of Milan of Lombardy.